WHETHER THE American Colonies would have had the necessary strength to implement the Declaration of Independence without the aid of France is problematical. Certainly the leaders of the rebelling colonists realized the importance of French assistance and began to seek, and to obtain, such help soon after the outbreak of the American Revolution. In the fall of 1775, the Continental Congress appointed a Secret Committee of Foreign Correspondence. Early the next year the committee decided to send an agent to France to seek the aid of that Nation in the struggle against Great Britain. Silas Deane was selected for the task. Within a few months after his arrival in France, Deane, covertly aided by the French Government, obtained and sent to America clothing and arms in large quantities. At DeaneÕs suggestion also, the Compte de Vergennes, French Minister of Foreign Affairs, obtained the KingÕs permission to lend America money. Until 1778, France continued to give America all aid short of actual military support. 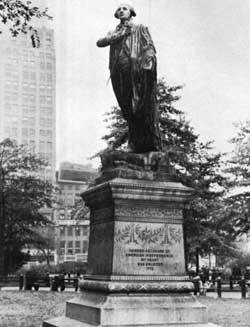 Lafayette Statue, by Bartholdi, in Union Square, New York City. In addition, many French soldiers, as individuals, offered their assistance to the American cause. One of the most conspicuous of these was the Marquis de Lafayette, who left wife, fortune, and high social position to serve the cause of liberty. Popular with the American officers and a great favorite of General Washington, the young Marquis was an able general and played an important part in the defeat of the British General Cornwallis in the final campaign of the Revolution. Congress, in September 1776, had appointed Benjamin Franklin and Arthur Lee as commissioners to France to collaborate with Deane in the transaction of diplomatic affairs and to work for a treaty of alliance. For slightly over a year the commission labored at its task. Then came the news of the American triumph at Saratoga. When word of this important victory reached the French King, he promptly sent word to the commissioners that he would sign a treaty such as had been proposed and that France would openly aid America with a fleet, troops, and money. The Americans were greatly encouraged by the French alliance. Until then, the English had had the enormous advantage of supremacy at sea. Thenceforth, the French Fleet, wherever it might be, compelled England, in resisting French attacks, to use many ships which could otherwise have been used in transporting troops and supplies to America. The French Army greatly augmented American land forces, and the final victory over the British at Yorktown was made possible by the French Fleet and Army. Thus, throughout the long struggle of the Revolution, the sympathy and assistance of the French people were of incalculable value to the American cause.